This meal is for when you want to eat light and want to put minimal effort in but still deliver a full flavoured meal. 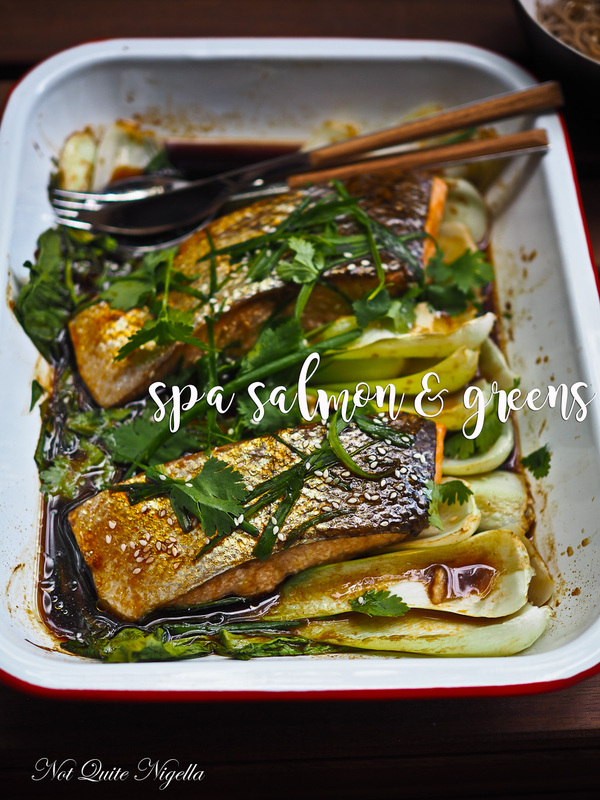 This "spa salmon" (aka a light dish) is no muted effort. 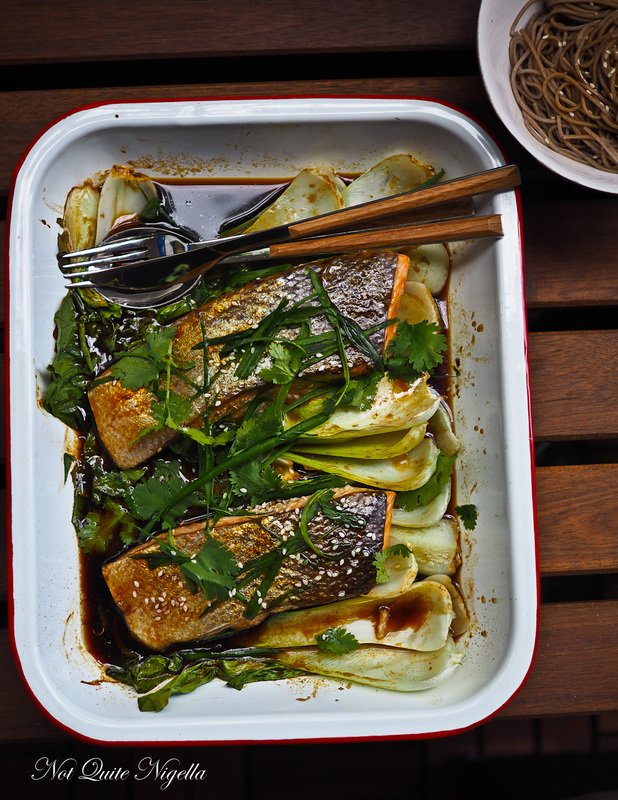 For an wholesome and light meal that you can bake in a tray this salmon with pak choy and soba will have you enjoying your weekend and making the most of the sunny weather. I'm going to go out on a limb here Dear Reader and make this a pushy recipe. I know it's on the healthier side of what I normally do but I was so delighted when this was cooked that I did a little dance of joy. That sometimes happens. And it's probably best that my only witnesses were Mr NQN and Mochi (who looked a bit confused). I made this dish last Sunday when it was around 38C/1004F. We had intended to go out for dinner but after market and supermarket shopping all we wanted to do was collapse on the lounge and relax. Getting dressed again and heading out into the heat held absolutely no appeal. 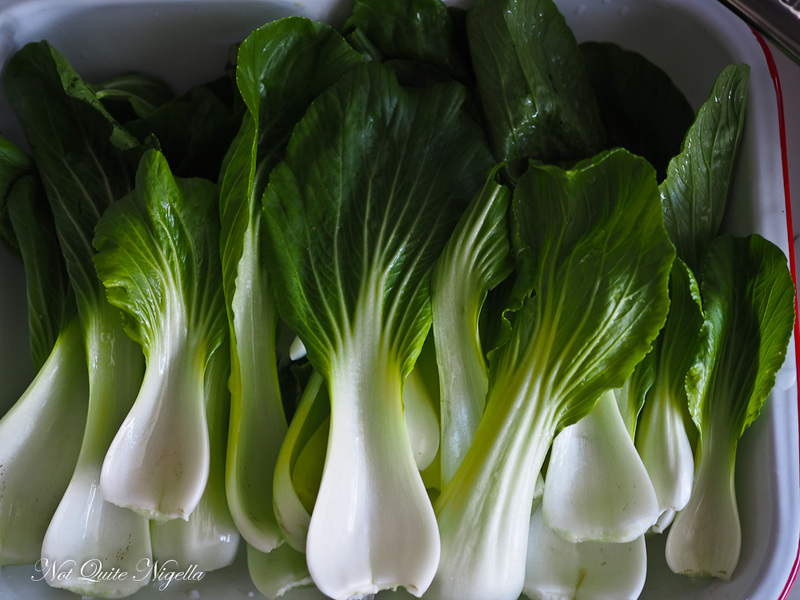 I was going to split the pak choy in half and then use them as a bed for the salmon but Mr NQN tore them off the stem. You see we have this little routine. Mr NQN has to clean pak choy. We both love eating it but I often find slugs in it so he does it. I also get him to pick lettuce at the shops too. Whenever I pick a lettuce it has a slug in it but whee he does it doesn't. It sounds crazy but it pretty much works all the time. He's like a slug repellent (although I don't call him this to his face ;) ). The salmon doesn't need much marinating-just 5 minutes will do while the oven is going and then it's everything in the oven. The soba (which is optional) is made in 5 minutes and then served cold with a sauce. Giving you plenty of extra time to do a jig or just relax! So tell me Dear Reader, what is your favourite fish to eat? Do you often eat or cook "spa food"? And do you have any agreements in your household about what one person will do? Step 1 - Preheat oven to 180C/350F. Mix the water, light and dark soy sauces, oyster sauce and sugar together well and marinade the salmon fillets for 5 minutes or however long it takes to preheat the oven. 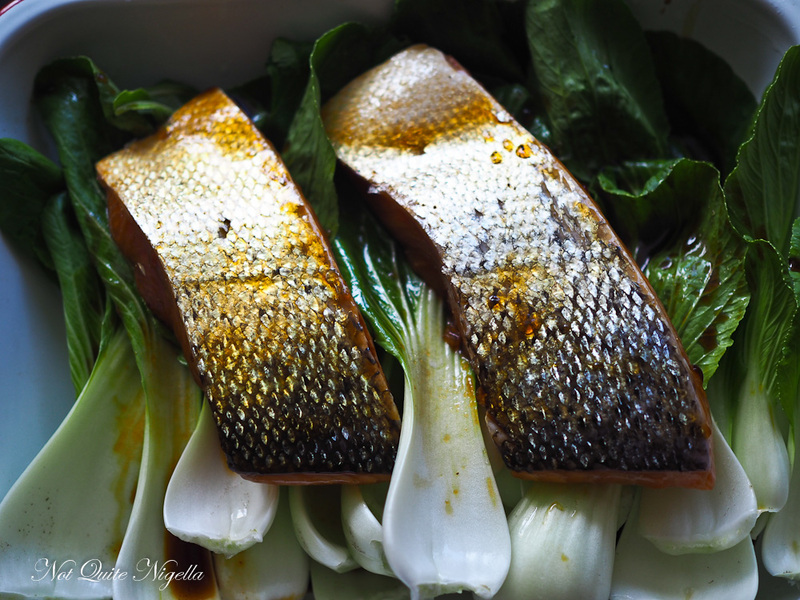 Lay the pak choy leaves on the base of a baking dish and place the salmon on top. Pour the marinade on top and bake for 15-20 minutes (15 if you have four fillets). Spoon some of the sauce back over the salmon and greens. 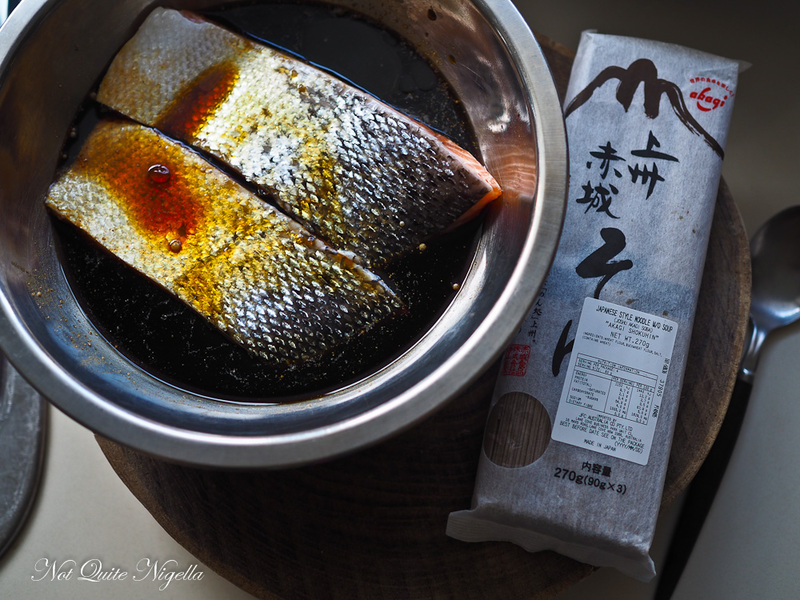 Step 2 - 5 minutes before the salmon is done place a pot of water onto boil and cook the soba for 4 minutes until done. Rinse in cold water and spoon a few tablespoons of the cooked marinade with the noodles so that they don't stick. Sprinkle with sesame seeds, shredded spring onions and coriander. featureLow Carb Easy Meal: Zucchini Pasta In Three Minutes! recipeThe Breakfast Club: Mocha Chia Nut Pudding! feature Low Carb Easy Meal: Zucchini Pasta In Three Minutes! recipe The Breakfast Club: Mocha Chia Nut Pudding!